Map 1B continues the treatment of a patient with serious depression issues. 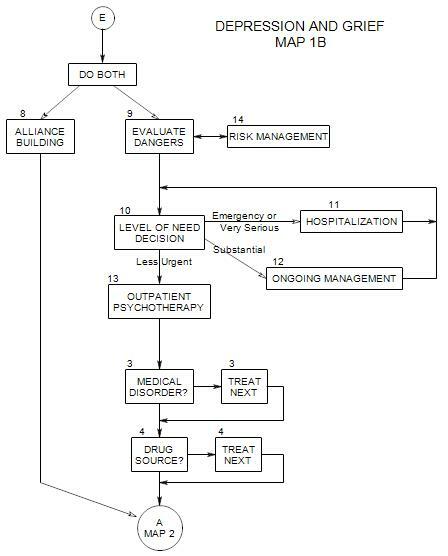 Deciding on the patient’s level of need and the amount of outside management needed to protect the patient and provide effective treatment [Section 10]. When outpatient psychotherapy is the approach of choice [Section 13], then beginning the diagnostic and treatment process by considering medical disorders [Section 3] and drug issues [Section 4] that may be contributing to the patient’s depression. The left side works in parallel, to remind us that alliance building [Section 8] is an important aspect of treatment all the way through. Note that the need for hospitalization [Section 11] and ongoing management [Section 12] are temporary options and the need for them requires continual re-evaluation. For that reason, the arrows leaving the boxes for hospitalization and ongoing management return to a point above the level of need decision. It is assumed here that every patient who stays in treatment will eventually need outpatient psychotherapy, so that becomes the final common path for Map 1B. Note also that we are not assuming that a period of time in a hospital setting or in management will handle all the person’s medical or drug issues. It might. But some people may revert to old habits on release from a hospital and need the kind of continues evaluation that you can provide afterward.